On Tuesday - almost a year to the day I took a one-mile bike ride with then-Stamford mayoral candidate David Martin - I rode my newly built city bike (I still hate Presta valves) to the Stamford Government Center and parked at the rack inside. 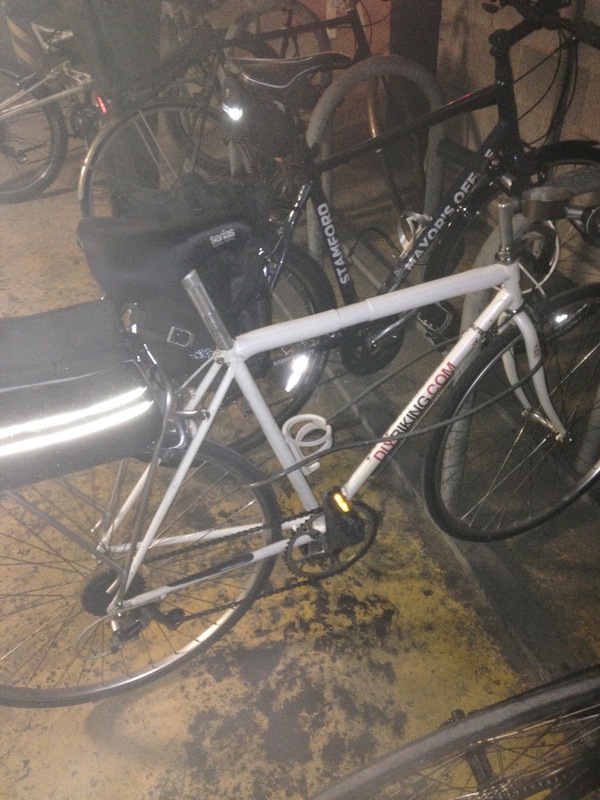 As it happened, I locked up next to the bike from Danny's Cycles that was given to the Mayor of Stamford on Bike to Work Day a few months ago. I noticed the tires were fully inflated and I didn't see dust on the seat when I looked closely. Good, I thought. Not only does that bode well, but the gift from Allied Barton and the Stamford Downtown Special Services District doesn't look like it's going to waste. But I'm off the subject. I came to the press conference to see the Stamford Street Smart public safety and awareness campaign take off (the link is here: http://www.stamfordct.gov/stamford-street-smart). Stamford Mayor David Martin, Police Chief Jonathan Fontneau, Sergeant Andrew Gallagher and others made a serious presentation in front of a good sized audience. After all: three pedestrians have been killed so far this year (and in the most recent case, according to today's Stamford Advocate post, the driver was charged). Some motorists out there are just dangerous and, like I've said, the stakes are different when a car hits a pedestrian or cyclist, but I was glad to hear the mayor wasn't letting cyclists or pedestrians off the hook for their (our) own bad behavior. The message out of the gate: be safe and look out for others no matter how you get around. Gold star. In some places I've lived - particularly in rural New Hampshire - it felt as if police had an incentive to give out tickets so the town may collect the fine. I remember, years ago, being upset about the size of a fine but don't recall ever being told to drive slower - and speed traps put a lot more emphasis on the 'trap' part with deserted, Fargo-like roads given an impossibly low speed limit. Sgt. Gallagher had no glee, hidden or otherwise, when talking about giving tickets and issuing fines. They are absolutely going to be doing those things (and I've already seen them do it), but the main goal is to convince people to drive and get around more safely. It was good to hear someone other than me remind cyclists, drivers and pedestrians that they should take ownership over their own safety - and the 'be predictable' and 'rules of the road' part can't be said enough when one is talking about cyclists. Stamford is a great place to ride, but when cyclists don't ride with traffic, don't pay attention and don't do their part when it comes to sharing the road - nobody wins. And please, cyclists: even if it is safe, stop going through red lights. You wouldn't do it in your car - and besides: you make the rest of us cyclists look bad and hand ammo to The Angry Town Hall Attendee - and there's at least one in every town. I saw plastic pumpkins for sale at Fairway this week, which kinda freaked me out. I also noticed apple cider and wince when I hear my 110 psi road tires crunching over leaves more. Yes, summer is over and the icy hand of autumn death is closing in. Nobody wants to hear it, but the police chief's reminder means that cyclists need to start remembering the bike light and the reflective vest when going out in late afternoons - because daylight a mere four weeks ago isn't at the same time as daylight now. It is a good time to revisit my three-part feature on staying safe safe while riding at night. "Please take your seats, everyone." When you do communications consulting and research for a living, it's hard to turn that part of the brain off. It sounds like a little thing, but it matters. At the press conference on Tuesday, there were a lot of people there, including representatives from the Stamford Downtown Special Services District, the Mill River Collaborative and city representatives. There were also other folks in the room, but almost all of them were standing behind the chairs - and the TV cameras. 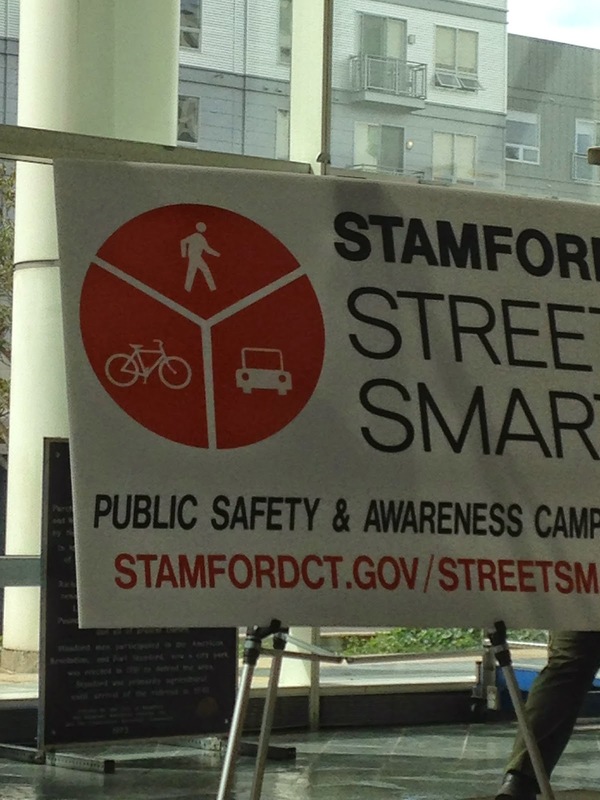 When News 12 Connecticut's Allison Bybee's great story on the Stamford Street Smart campaign (complete with a familiar-looking area cyclist) came out later, the opening shot of the conference made it look like just a few people were in the audience. Take my word for it, there were a lot of people there, but because few were sitting down, it didn't look like a lot of people were interested in hearing about safer streets in Stamford. "We're keeping a dialogue open on Twitter with the hashtag (#blank), so please remind your friends, family and colleagues to be safe and let us know of problem areas you know about." The News 12 story indicated there will be a social media component of Stamford Street Smart coming out in the future. But Tuesday's conference would have been a great time to allow word to spread to those who were not there - especially given the size and scope of the kickoff event. Social media mostly works when you get people to do your promoting for you, and even though the city and the police department are clearly no strangers to doing more with less, putting social media out there on day one would have made the conversation about safety even louder. There'd be junk posts, for sure, but it would also allow the city to learn more about dangerous roads and intersections that may have been overlooked. "If it can be done safely, bike and walk more and drive less." As you remember, I was very frustrated in the aftermath of Hurricane Sandy when Governors Dan Malloy, Chris Christie and Andrew Cuomo didn't say those thirteen words. Thousands upon thousands of people - many of whom had their lives turned upside down from the storm - were running around Fairfield County searching for gasoline like a business casual Mad Max film. I tried my best to keep the line at the gas stations short by using a bike during that period; I even towed a cooler with me so I could do big grocery trips. Imagine if state and municipal leaders actually said those words. Most people would have shrugged it off, but we have to be realistic about something: the fewer cars there are on the road, the fewer traffic jams and car accidents we will have. Not only that, but motorists will have an easier time finding a place to park if more people bike instead, and Stamford will collapse and fall in on itself if every single person living in one of the new condos and apartments sprouting everywhere drove a car whenever they wanted to get around. You know those fights people have been having on airplanes lately about a couple of inches of legroom? With cars, it will be worse. "People don't choose to live in unsafe cities. They also don't choose to go shopping, open businesses, or take a job in cities or towns when they don't feel safe." Obviously, the leaders at the podium were right to talk about the pedestrian deaths the way they did - and Police Chief Jonathan Fontneau nailed it when he mentioned the massive growth of residential properties in the city. But there's another point that needs to be hammered continuously: the future of this city depends on safer streets - and on implementing a complete streets policy. If there's no music, they can't dance, if they can't dance, they can't kiss, and if they can't kiss, they can't fall in love. Wait: that's a line from Back to the Future. Let me try again: If Stamford picks up a reputation for being a dangerous city, families and businesses will move out. If they move out, apartments and commercial properties go vacant. If they go vacant, tax revenue falls…and so on. Safe streets aren't just important, they mean everything to everyone. 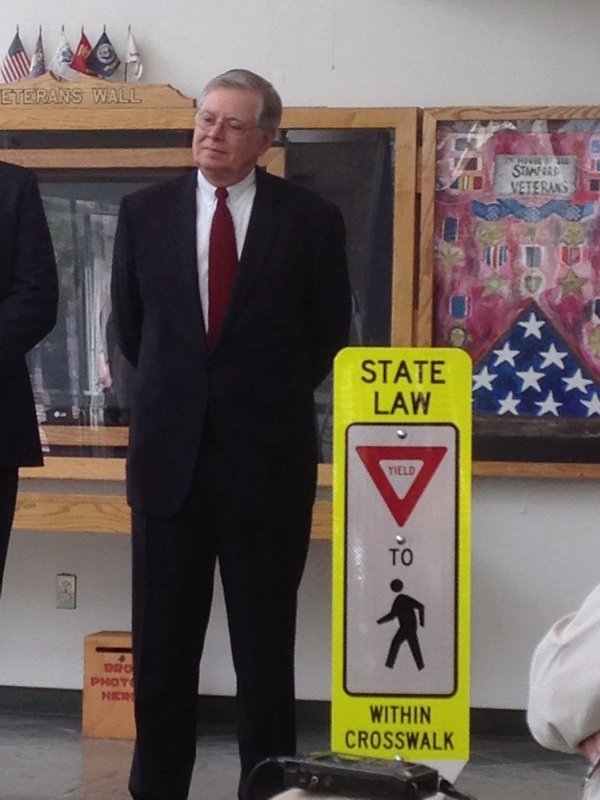 I thank the city of Stamford for creating the Stamford Street Smart campaign. I hope it works and everyone does their part to be a better driver, a better cyclist, and a better pedestrian. And it's time for some grit: it took decades of good leadership and good policing to create a city mostly safe from muggers. It'll take a lot more than $25,000 and a lot more than 21 days to make Stamford an ideal place for cyclists and pedestrians. Be safe today, tomorrow and forever more. Thanks for reading and thanks for riding.